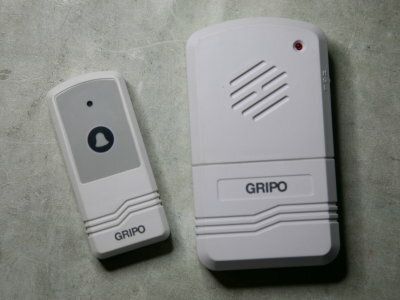 Some ages ago I had bought a wireless doorbell on sale somewhere. It operates on a license-free frequency of 433.92 MHz. It was cheap, and junk like that has a tendency to be useful, so I bought it. Originally I thought I'd use it as a radio beacon on a model rocket. The range it achieved was quite impressive. The sound it made was quite annoying. ("Diiing-dooong", pause, "diiing-dooong", pause, "diiing-dooong".) Both the transmitter and receiver units had a 4-digit code printed on a sticker, implying that a unique (well, semi-unique) code is used to avoid interfering with your neighbor's similar unit. Listening in on a scanner radio, the doorbell transmitter apparently transmits its code continuously as long as the button is pressed. The doorbell never did end up onboard a rocket, but after letting it gather dust for a few years, I thought of another way to put it to use: as a remote for my camera. With an oscilloscope I quickly located a promising candidate for an output pin. Its signal was somewhat messy: it pulsed briefly when I first pressed the transmitter button, but did not remain high if I held the button. It did, however, go high during the pauses in the ding-dong. During the actual noise, it would flicker high and low every now and then at random. I would have preferred, of course, it to remain high as long as I pressed the button, in order to shoot bulb exposures or series of pictures. 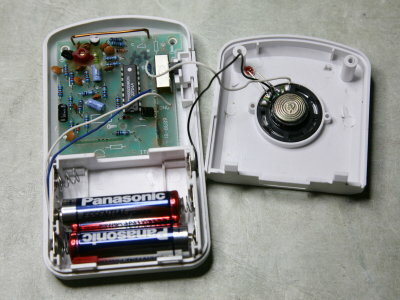 A cursory study of the circuit layout showed that of the three AA-cells in the battery compartment, only two were used by the receiver circuitry, and the third was wired directly to the speaker only. I confirmed this by removing the third battery. The speaker went silent, but the oscilloscope still showed the receiver to work—and now the output did remain high as long as I pressed the transmitter button! Huh??? 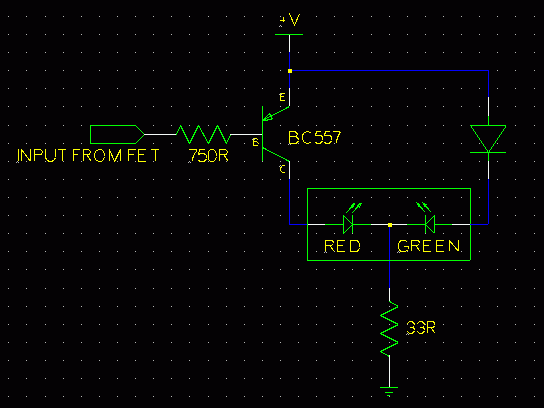 This worked only with the transmitter close to the receiver—it seems that while the speaker interfered severely with reception, the speaker driver circuit still caused some interference. 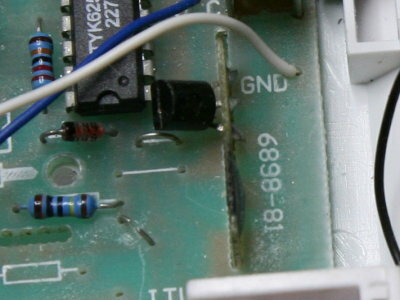 Following the circuit board traces going to the speaker, I found that the ding-dong sound was probably not produced by the same decoder IC, but by the tiny little daughter-board soldered to the main board. 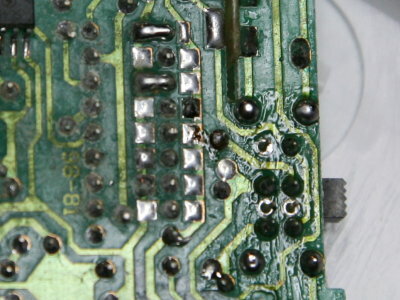 It contained a single transistor and a tiny little board-mounted IC covered in a blob of epoxy or something. The signal from the decoder IC was passed to it via a small jumper wire. So I cut the wire, and the interference was gone. Now I could control the receiver output exactly how I wanted to, at full range! Perfect! I had to cut up an existing third-party remote cord to obtain the fscking proprietary N3-connector that Canon has adopted on the EOS-3, the EOS-1 series, the 5D etc, just to annoy us. 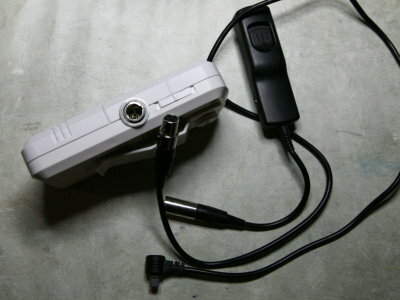 I used mini-XLR connectors on the radio receiver, and to splice the remote cord. They're small and light, available as cable-mounted and panel-mounted versions, and they lock in place. Later on I added another small modification to the unit: The Canon PowerShot series of toy cameras, with the CHDK software, can be triggered by applying a voltage to their USB port. Add one PNP transistor, one resistor and a USB connector, and the remote can trigger a PowerShot as well. Of course, one important aspect of these modifications is that I never messed with the transmitter. It is still in its original condition, and therefore still conforms to whatever rules apply to that kind of license-free radio equipment (assuming this el-cheapo device conformed to them in the first place...). And of course, if you decide to attempt a similar modification, you do so completely at your own risk. 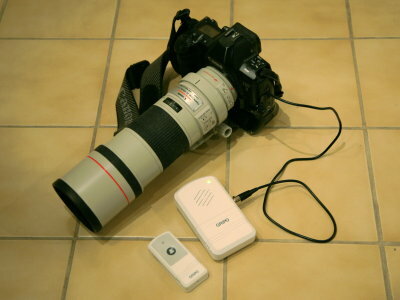 It is entirely possible to damage your camera in the process, or at least break the doorbell, or you may end up causing massive RF interference which gets you thrown in jail. Whatever you do, have fun, but don't blame me.